It doesn’t seem to be a good year for Microsoft fans, especially fans waiting for the Windows-powered mobile device to show them all who’s boss. Actually, it has never been a good few years for Windows Phone/Windows Mobile believers and, at least for now, it sounds like they never will have a good year. The Surface Phone and Andromeda OS have been shelved indefinitely and considering this isn’t the first time something like it happened, it is perhaps worthwhile to look into Microsoft’s pattern of dashing its own fans’ hopes and dreams. One can probably trace that behavior all the way back to the Microsoft Courier way back in 2008 and formally canceled in 2010 even before it had a chance to come out as a prototype. It was only later that Microsoft even acknowledged its existence, much less why it was killed. At Build 2018, it made that story more or less official. The official story, in a nutshell, it wasn’t the right time for Courier. This was back when Microsoft was pushing Windows 8 and Windows Phone 8 as its primary platforms for PCs and smartphones. Courier, in contrast, ran a completely customized version of Windows that didn’t fit into that puzzle. Nor did it fit with any of Microsoft’s cash cows, like Office. Considering the disaster that was Windows 8, however, Microsoft could have actually gained a bigger lead had it stuck to Courier. That wasn’t the only broken dream either. This time, Microsoft did make promises and formal announcements, only to slowly back out of it with less formality. It even had actual products it sold to early adopters. Never mind Windows RT or the Surface Mini. We’re talking about Windows Mobile and Continuum. After Windows Phone failed to gain a foothold, Microsoft shifted its strategy a bit. With Windows 10 Mobile, it built a smartphone-friendly experience on top of a universal Windows 10 base. And with Continuum, more capable Windows Mobile devices could function as a desktop as well. Both of those are now practically dead. Microsoft has not yet formally declared it but there is no question left in anyone’s minds. The reason, at the end of the day, is pretty much the same as Courier’s: it’s not the right time for it. At least not anymore. Under Ballmer, Microsoft tried its hand at being its own smartphone maker and failed miserably. Under Nadella, Microsoft reinvented itself not just as a software company but as a cloud-centric company. It was, in short, more interested in getting its services, not even its apps, to as many people as possible. In other words, it was far easier to push Office, Cortana, and Bing to Android and iOS than it was to make and sell its own devices. With extremely few exceptions, namely the Xbox and the Surface, Microsoft has traditionally failed at hardware. Not that it didn’t try hard. Ironically, the Surface Phone and Andromeda are being shelved because the powers that be didn’t feel like the software was up to par. Because, if the recent leaks are accurate, it was focused too much on the Surface Phone hardware. Foldable phones, whether with actual foldable screens or just two screens hinged together, is definitely not easy to make but they are also inevitable. Sooner or later, all these companies like Samsung, Lenovo, Huawei, and maybe even Apple will all put out one or more. Microsoft hardly has a prayer in beating those. Instead, it’s ace would have been its software. None of those foldable phone makers has had the experience of attempting an experience that was actually designed for such a form factor. Microsoft has. It even has right at this moment many of the pieces that could be stitched up to make a Courier. Unfortunately, just having pieces doesn’t mean you can immediately make a whole, and looking back at first experience with Windows 10 S and Windows 10 on ARM, it might have been a smart choice to let the ingredients simmer longer. The other and perhaps real reason Microsoft decided to “postpone” Andromeda is that, yet again, the time isn’t right. 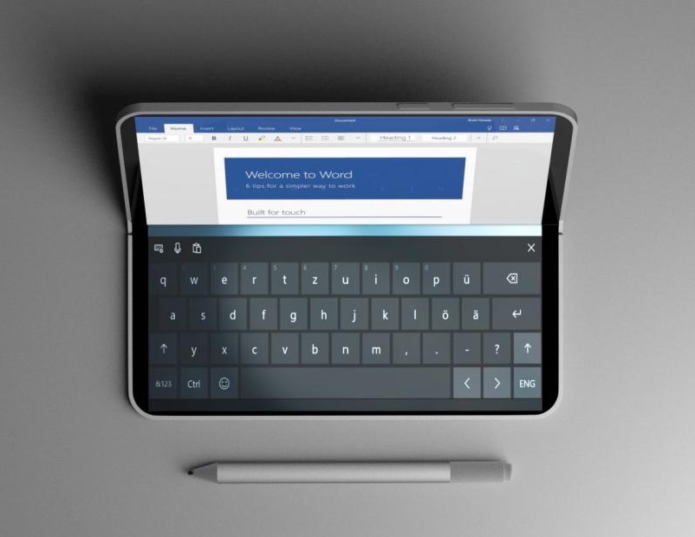 They don’t see a market for such a foldable, pocketable, Windows device that won’t be able to run majority of Windows software. It’s hard to argue against that, especially when money is involved. After all, Microsoft has also been criticized for creating solutions that are in search of problems, like Windows RT and the Windows 10 S and Windows 10 on ARM devices. The other side of the coin is that all this waiting for the right time and market is making Microsoft lose out on the opportunity to actually create and define that product. Some of the most successful tech products weren’t made because there was a market for them. They were made because their creators saw a need that people never realized they had. In a way, they surfaced (no pun intended) the need or even artificially created one. But if Microsoft keeps waiting for a time when there’s a market for a foldable pocket computer, it will always end up playing catchup and renting on other people’s platforms. Microsoft has changed a lot, whether or not you believe it to be sincere. It is more open, more embracing, more agile, and, unfortunately, also more stagnant. After being in the sidelines for so long, Microsoft is desperate to cling to its renewed position in the market. To the point that it seems to be scared of venturing into new and uncertain territory. Its new Windows 10 strategy is definitely radical for the old Microsoft, but it’s something its mobile competitors have long been practicing. In fact, it ironically allows Microsoft to look like it’s moving fast when it’s really just inching forward. It struck a goldmine with the Surface Pro and has expanded that brand to include seemingly unrelated products, just for luck. The Xbox One is almost five years old and Microsoft insists it can still squeeze out more, perhaps indefinitely. Ballmer has been blamed for many of Microsoft’s flops but he was at least audacious and bold. Microsoft has been wounded and now, like a wounded animal that has found new sanctuary, it is content to lick its wounds and stay put.